Little Miss Ann has enjoyed national acclaim and a fervent following for her upbeat, down-to-earth and interactive folksy music. 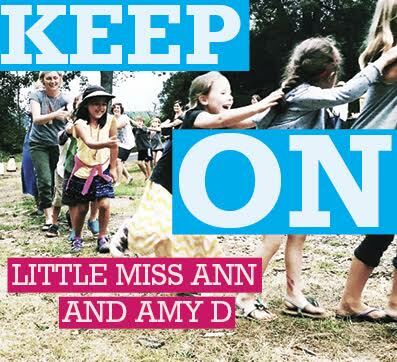 Her fifth album of hopeful and happy songs, Keep On, is the result of a collaboration with children’s music newcomer Amy D. Keep On will be available from various music retailers and from littlemissann.com on February 17. Recorded in the Hudson Valley of New York with Grammy-winning producer Dean Jones, Keep On ranges in musical styles. Grownups will appreciate the 50’s doo-wop sounding song, “L.O.V.E.,” the Andrew Bird-meets-Liz Phair ode to Chicago “The 606,” as well as re-imagined traditional favorites like the Johnny Cash-esque “Where Is Thumbkin?” and a spirited Calypso song that originated in Jamaica called “Hill and Gully Rider.” There’s even a springy-swingy rendition of “Tiptoe Through the Tulips,” blending sweet harmonies, mandolin, and a toy piano. As Jones says, “These two complement each other perfectly. If it sounds like we were having fun it’s because we were. These songs come straight from the heart!” Guest artists include Latin Grammy winner 123 Andrés and Tim Sutton from Ratboy Jr.
New to the independent family music scene and originally hailing from Nashville, Amy D sings and plays violin, mandolin, melodica, and piano. After meeting at a kids’ music class in Chicago, Ann and Amy discovered that they had many things in common, musically and culturally. Amy D joined Little Miss Ann’s band in 2015, and the musical connection led to the process of writing and recording the songs of Keep On. Ann and Amy provide a fresh take on the tradition of sing-along, call-and-response style songwriting of trailblazers like Chicago-based Ella Jenkins, Raffi, Elizabeth Mitchell, and other enduring artists of the genre. Many songs on the album are also firmly rooted in Chicago. Indeed, the songs grew out of both artists’ experiences in working with families: Ann in education (including Chicago’s historic Old Town School of Folk Music) and Amy in social work. Their common Filipino backgrounds inspired two of their original songs: “Ube,” about a cherished Filipino staple, the purple yam, and “The Senses Song,” which mentions halo-halo and lychee, sweet treats from Filipino cuisine. Produced with the help of a successful Kickstarter campaign, the digital edition of Keep On is available in January via Bandcamp. It will also be available on physical CDs and for downloading from cdbaby.com, amazon.com, and iTunes on February 17. A CD release party will be held at Chicago’s Beat Kitchen on February 26, and on March 26, Ann will perform at Jalopy in Brooklyn, NY, with award-winning artist Suzi Shelton. The duo is also busy planning music videos to reflect this shared musical and cultural heritage. The CD will be available on February 17th and you can pre-order the CD now via Amazon and iTunes. Little Miss Ann (a.k.a. Ann Torralba) is a first-generation Filipina-American. She is a former Chicago Public School teacher and a veteran instructor at the esteemed Old Town School of Folk Music. 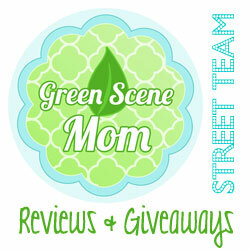 Ann is a founder of the Windy Kindie Chicago Cooperative and has written about all things Kindie for various websites. Little Miss Ann has made four other children’s music albums and has produced several concerts. She produced a popular Nodcast Podcast for the Land of Nod and contributed a song to Keep Hoping Machine Running – Songs of Woody Guthrie (benefiting the Woody Guthrie Archives). Ann lives in Chicago with her husband and daughter. Amy D (a.k.a. Amyliza de Jesus) is also a first-generation Filipina-American, and currently a licensed clinical social worker specializing in music therapy. She has worked with children and families in a variety of settings for the past 13 years. Her intention is always to incorporate music, whether she is working in school and family counseling, case management, therapy, or preschool literacy outreach. Originally from Nashville, Amy began playing piano and violin as a pre-college student at Vanderbilt University’s Blair School of Music. She went on to major in piano performance, and began songwriting in college. She is currently collaborating with other artists to create therapeutic songs for children, and is a substitute teacher in the Wiggleworms programs at Old Town School of Folk Music. Self Disclosure: I received a CD to facilitate this post. Info and photos were also provided. 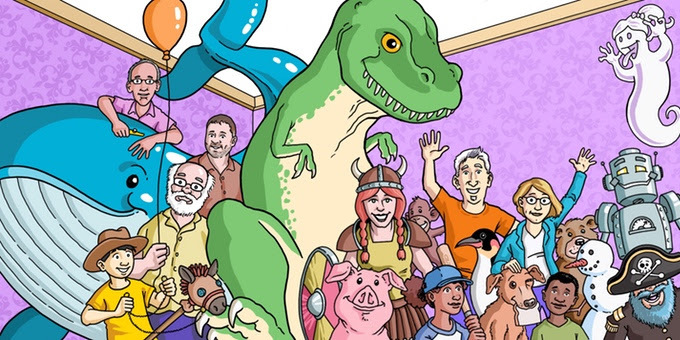 Keith Munslow, a multiple award-winning songwriter, storyteller, cartoonist and improv comedy performer, teams up with a fresh new voice in family music, Bridget Brewer, for a harmonious salute to the ups and downs of friendship. A collaboration among a big bunch of “goofs, music makers, adventurers, and creators of wild, crazy music that’s fun for the whole family,” the rootsy 11 songs of Big Buncha Buddies, are now available now digitally via CDBaby and iTunes. Starting today, fans may purchase the album from www.keithmunslow.com and other distributors. Known nationwide for his SiriusXM Satellite Radio hit “Coffee Breath,” Munslow brings his quick wit and wry perspective on family life to these new songs (“That Was a Bad Idea,” “It’s an Adventure,” “Why Did You Teach Me That Word?”). His past collaborations with Grammy winner Bill Harley have won awards, national acclaim and radio play. Munslow’s own family recordings (Accidentally on Purpose, Dressed Up for the Party and Homemade Fun) have also drawn national accolades. He brings a piano-forward, fully orchestrated sound to the songs of Big Buncha Buddies. The colorful comics-style cover art is by Eric Fulford, and album design is by Stuart Wilson. Brewer will return to Providence in the spring, when the duo will perform an album release celebration concert. Munslow is performing at several schools this winter and will appear with Bill Harley in an annual “Sing Away Hunger” concert benefiting the Rhode Island Food Bank on February 4. 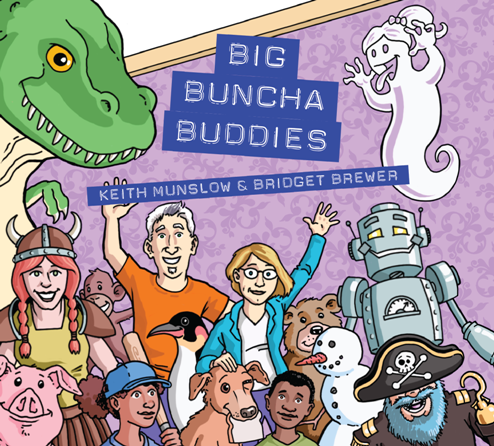 For more information aboutBig Buncha Buddies and Keith and Bridget’s upcoming music and tour dates, visit www.keithmunslow.com . I received a copy of the CD and I think that the songs will be a hit with younger children! The songs are cheerful and fun! I really like the fun lyrics and highly recommend for younger children! Self Disclosure: I received a copy of the CD to facilitate this post. Info and photo was also provided. Peaceable Kingdom Valentines are a Must-Buy this Month! Scratch & Sniff Valentines that your child will love! Looking for creative Valentine’s Day cards for your children to give out this Valentine’s Day? 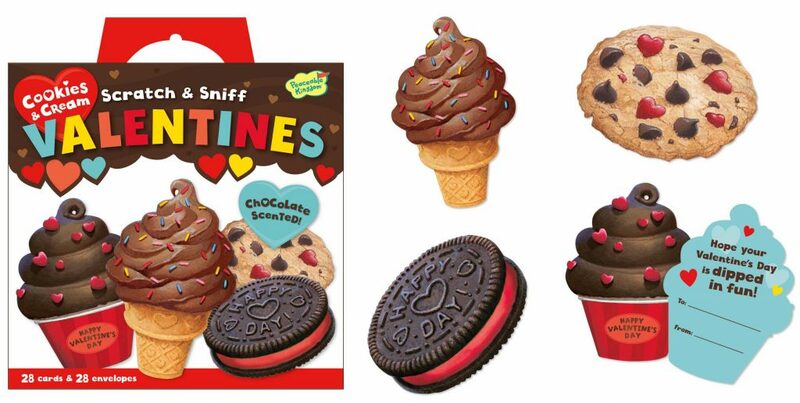 I have to say that my favorite are the Cookies & Cream Scratch & Sniff Valentines from Peaceable Kingdom! They are actually chocolate scented and there are the cutest designs! There are Cookies, Cupcakes and Ice cream cones! There are 28 Chocolate Scented Valentine Cards and 28 envelopes. The greetings are fun such as “Hope your Valentine’s Day is dipped in fun!” And, did I say they really smell like Chocolate?! Now, how cool is that?! They cost $12.99 and can be bought here. 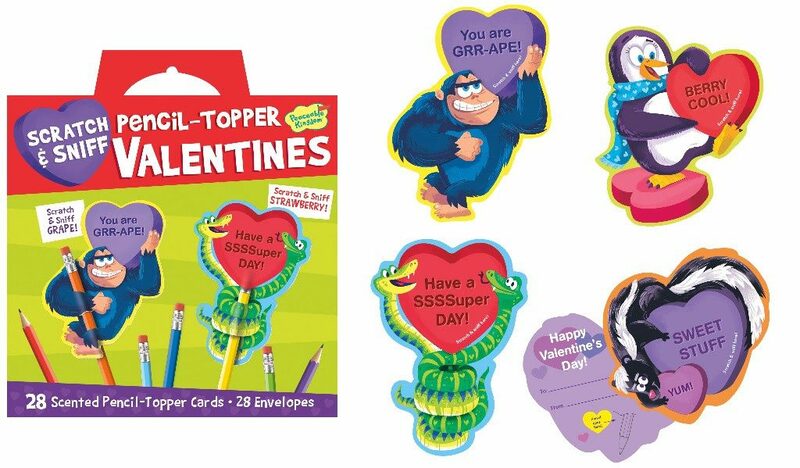 I also like the Scratch & Sniff Pencil Topper Valentines! These are just too cute! I also like that they are a great choice for classes! They smell just like Grape & Strawberry and go great on a pencil! This set also includes 28 Scented Pencil-Topper Cards and 28 envelopes. You can buy these here for $12.99. Find these and many more at Peaceable Kingdom! They can also be found at Amazon, Whole Foods, Paper Source, local toy shop. 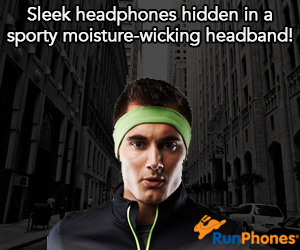 Self Disclosure: I received free sample products to facilitate this post. No other compensation was received. Photos were provided. Li’l Mackie is Pet of the Week! There’s nothing that “li’l” about Li’l Mackie! Mackie came in as a skinny stray, but he’s filled out to an impressive, healthy 80 pounds. 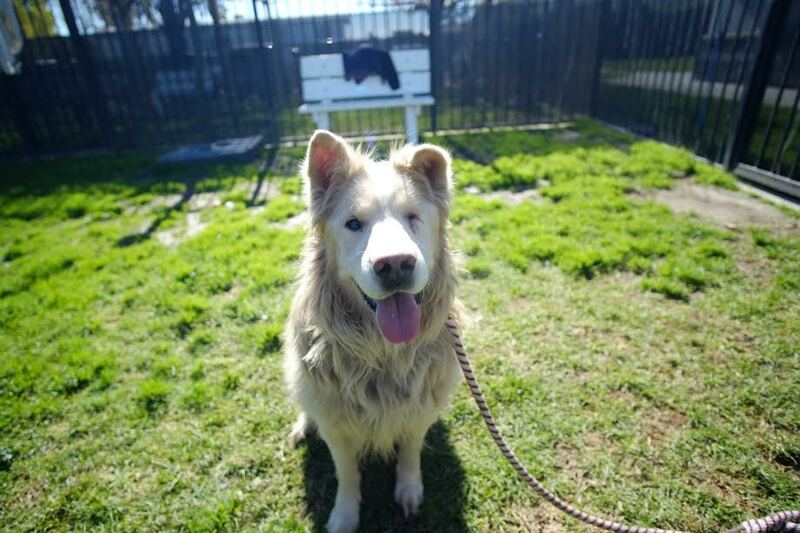 He’s a 6-year-old golden retriever who’s got big smarts, big love and big charm. In fact, the only thing li’l about him is his name! Meet Li’l Mackie on the shelter side of the Companion Animal Village at 7700 East Spring St., (562) 570-PETS. Ask for ID# A413267.